Class I cavity prepared in lower first molar, occlusal surface, for the reception of gold foil as the restorative material. a. Structural defects must be removed, though all need not be included in a single preparation. b. All enamel which is undermined or is not supported by sound dentin is removed. (1) Allow thorough instrumentation of the cavity preparation. (2) Allow proper manipulation of the restorative material. (3) Provide sufficient but not excessive bulk of restorative material. e. Margins should not terminate in a facet of wear. a. Must include structural defects and undermined enamel. b. Must stop short of the height of the marginal ridge or else include the proximal surface. c. Should retain sufficient dentinal support of the enamel of the marginal ridge. 1. To withstand forces applied in the condensation of the gold foil. 2. To withstand forces exerted externally upon the completed restora­tion. b. At right angles to the long axis of the tooth. c. Established just within the dentin (Fig. 2). 2. 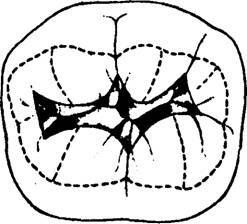 All the surrounding walls of the cavity slope slightly outward from the pulpal wall (Figs. 2 & 3). 3. 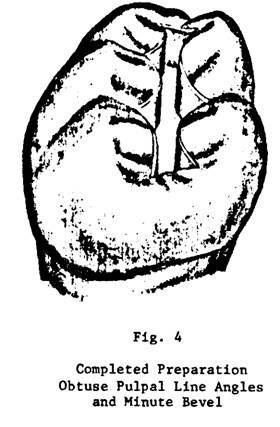 The mesial and distal terminations of the buccal and lingual walls, as they meet the mesial and distal walls, may be slightly undercut; the undercutting is done at the expense of the buccal and lingual walls, and not at the expense of the mesial or the distal wall (Fig. 3). Care must be taken to not overcut in these areas; in many instances this accentuation of the point angles is not neces­sary at all. It is established to permit the introduction of the gold foil condensing instruments with the correct line of force so as to secure the proper adaptation of the restorative material to the walls of the cavity. As a rule when the outline form has been correctly placed, convenience form is automatically established. 1. The walls are planed smooth with a cutting instrument. 2. The cavosurface angle is planed to a smooth outline. 3. The final planing removes any fragile enamel rods, the degree and form of the cavosurface angle being dependent upon the extent of the cavity. 4. A very slight cavosurface bevel is formed (Fig. 4). 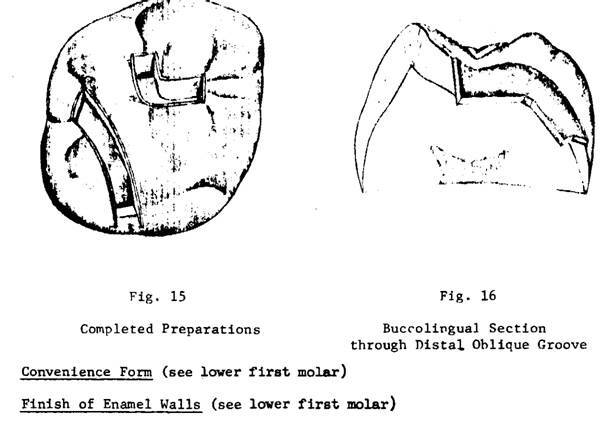 Class I cavities prepared in upper first molar, occlusal surface, central pit and distal oblique groove, for the reception of gold foil as the restorative material. If possible, do not cut through oblique ridge. Structural strength of the tooth is much greater if the integrity of this ridge is retained. However, this conservation must take second place to the basic fundamental that "all structural defects are removed". 1. Requirement in these small cavities is essentially to withstand forces applied in the condensation of the gold foil. b. At right angles to long axis of tooth. c. Established just within dentin. b. 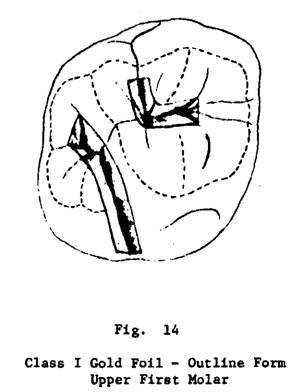 Parallel with general surface contour of tooth. c. At uniform depth throughout. d. Meets gingival wall at right angle. e. Axio-pulpal line angle slightly beveled. a. Slope slightly outward from pulpal and axial walls. b. Meet the axial and pulpal walls to form definite sharp angles.